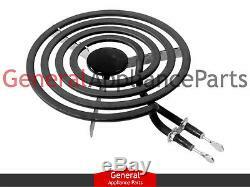 Whirlpool Jenn-Air Range Cooktop Stove 6 Small Surface Burner Element 326787. This 6 burner element has 4 turns/rings and has a Y-Frame structure to support the element. This burner element is rated at 1500 watts. The wire looped terminals have been replaced with these solid terminals. This element also replaces some flat style terminal elements. Whirlpool Estate KitchenAid Roper Maytag Admiral Amana Speed Queen Jenn-Air Magic Chef Crosley Caloric Glenwood Hardwick Menumaster Modern Maid Montgomery Wards Norge JC Penney Wards Sears Kenmore. The surface burner elements, those metal components that get red-hot and generate heat, are the most important parts of any range. When the elements fail to heat properly, it's time to replace them. It's a simple procedure any electric stove owner can easily accomplish in a few minutes' time. You can usually identify a burnt-out element by blistering or small holes on the element's coils. A burner that plugs into a receptacle is easy to test, just unplug the non-heating burner, plug it into another working receptacle, restore the power to the range, and test it. If the burner works, you know its original receptacle is probably faulty. If it doesn't work in the good receptacle, the burner is bad and must be replaced. Do not be alarmed if a new element smokes a little when you first use it. 326787 4164222 403870 403512 325510 325510 325507 321014 319266 318580 312557 306667 306666 306665 306664 303251 301412 299685 299466 263901 263893 263569 263564 263563 263558 263375 263146 263140 263090 256804 256803 256699 256698 256697 256696 244963 244957 244948 244146 244145 244062 244058 244012 242417 241742 241418 241417 241416 236140 14210966. 1303^0A 1303W0A 1433^0A 1433^1A 1433^2A 1433W0A 1433W1A 1433W2A 1453^0A 1453W0A 1463W0A 1463W1A 1463W2A 1743W0A 1833^0A 1833W0A 221600 221610 221620 2216W00 2216W10 2216W20 223600 223610 223620 2236W00 2236W10 2236W20 24130A 2413W0A 24539A 2453AA 2453W9A 2453WAA 2454X0A 2454X1A 2454X2A 2454X3A 24960 24960A 24961 24961A 24962 24962A 2496X0 2496X1 2496X2 C3357^0 D52572 D5257X0 D5257X2 D57570 D5757X0 D97575 D97576 D9757^1 D9757W5 D9757W6 F50071 F5007W1 F51080 F5108W0 F5907W0 F5908W0 F71071 F7107W1 F71080 F7108W0 F7907W0 F7908W0 F91571 F9157W1 F92570 F92571 F9257W0 F9257W1 F97571 F9757W1 F98580 F9858W0 KECG260SWH1 KECS-1040WH KECS100SWH0 KECS100SWH1 KECS1040WH KECS160SWH0 KECX160SWH0 KECX260SWH1 LSE2700W LSE2700W-8 LSE2700W-C LSG2700W N31571 N3157W1 N32571 N3257W1 N91570 N91571 N9157L0 N9157L1 N9157X0 N92570 N92571 N92572 N9257L1 N9257L2 N9257X0 N9257X1 N93570 N93572 N93573 N9357L0 N9357L2 N9357L3 N94572 N94573 N94574 N94575 N9457L3 N9457X2 N9457X3 N9457X4 N9457X5 RC8536XTW0 RE953PXKT0 RE953PXPT0 RE953PXPT1 RE960PXKW0 RE960PXKW1 RE960PXKW2 RE960PXPW0 RE960PXPW1 RE963PXKT0 RE963PXKT1 RE963PXPT0 RE963PXPT1 RF0100XKW0 RF0100XKW1 RF010ESPW0 RF010EXPW0 RHM973PP0 RHM975PW RHM975PW1 RHM988PW RHM988PW1 RM955PXKW0 RM955PXLW0 RM955PXLW1 RM955PXLW2 RM955PXPW0 RM973BXPT0 RM973PXKT0 RM973PXLT0 RM973PXLT1 RM973PXLT2 RM975PXKG0 RM975PXKN0 RM975PXKW0 RM975PXLW0 RM975PXLW1 RM975PXLW2 RM978BXPW0 RM988PXKW0 RM988PXLW0 RM988PXLW2 RM988PXLW9 RM988PXPW0 RS3025XBN0 RS3025XBN1 RS3025XBW0 RS3025XBW1 RS310PXBH0 RS310PXEB0 RS310PXEB1 RS385PCBN0 RS385PCBW0 RS385PXBH0 RS385PXBQ0 RS385PXEB0 RS385PXEB1 RS385PXEQ0 RS385PXEQ1 S5007W0 S95072 S9507W2. Our mission is to become the #1 source for all your appliance part needs. We will attempt to process your address change, cancellation and order change as quickly as possible. However, we cannot guarantee that we will be able to provide this service. Please review your order for accuracy before submitting it. The time frame depends on your location and is determined by the Post Office. You may go to their website and click "Calculate a Price" to determine if your package will take one or two days to deliver. Please note that appliance manufacturers frequently update their parts without warning. While we strive to update our listing pictures as quickly as possible, an outdated picture is not grounds for return. This is to insure that we can file a claim with the carrier when applicable. All items must be in a brand new (without signs of installation) and resaleable condition. All parts are inspected for signs of installation upon our receipt of them. In no way shall General Appliance Parts be liable for any loss, damage, fire, explosion, injury, including any incidental or consequential damages, or death as a result of ordering and/or installing any parts from our website or from the results of any action taken due to reading information found on our website. The information is provided as a courtesy to our customers to enhance their understanding of their appliances, it is not to be taken for instructional purposes on how to repair their system. General Appliance Parts suggests having all parts, accessories and equipment installed by a qualified heating and air conditioning technician. If a customer attempts to install a part, accessory or equipment, he or she should have a thorough understanding of electricity, reading wiring diagrams and the work to be performed. In no way shall General Appliance Parts be liable for any loss, damage, injury, including any incidental or consequential damages, or death as a result of ordering and/or installing any parts from our website or from the results of any action due to reading information found on our website. The item "Whirlpool Jenn-Air Range Cooktop Stove 6 Small Surface Burner Element 326787" is in sale since Wednesday, May 23, 2012. This item is in the category "Home & Garden\Major Appliances\Ranges & Cooking Appliances\Parts & Accessories". The seller is "generalapplianceparts" and is located in Louisville, Kentucky.